Losing weight is a challenge, but reaching a healthy weight can vastly improve your overall health and well-being. Becoming fit requires dedication, commitment, and willpower. You also need to have a plan to help you eat healthy and exercise if you want to lose weight. Obesity can cause a laundry list of health problems, such as heart conditions and diabetes. Being overweight can also worsen other symptoms like hot flashes, mood swings, and loss of libido. However, it is possible to change your lifestyle and lose weight to become healthier.This month-long plan, is not a diet, but will help you follow positive patterns of behavior that are fun and beneficial. The foods, activities, and hobbies explored can keep your weight in check, especially during menopause. The first week is all about little shifts and becoming aware of bad habits. During Monday, Tuesday, and Wednesday, keep track of unhealthy foods like chips, sugary drinks, and sweets that you eat. Also, note how much time you spend in front of a screen, whether it be computer, television, or cellphone. During the second half of the week, cut both in half and replace screen time with brisk walks in the park or around your neighborhood, or doing whatever type of exercise suits you. Your snacking should consist mostly of fruit, vegetables, yogurt, or a handful of nuts. When you are thirsty drink water, herbal tea, or 100% juice. Do you eat a lot of fried foods or red meats? What about dairy and simple carbs? Unfortunately, these will facilitate weight gain and are not good for your overall health. Start by replacing red meat with lean proteins, such as beans, turkey, fish, and tofu. Instead of deep fried foods, pan-fry your tofu with some potato and veggies with a tablespoon of extra virgin olive oil for a healthy crunch. Cut down on dairy in general, as it should not be included with every meal. Also, go for whole grains like quinoa, brown rice, and oats, instead of white breads and pastas. Be proud of your choices at the grocery store. Now that you have begun to make your meals healthier, cut down on snacking, and included brisk walks, it's time to up the exercise. You may have already noticed how great the walking makes you feel. Let the cardio continue by doing 2.5 hours of exercise each week. Switch it up between bicycling, swimming, walking, jogging, elliptical, and even dancing - whatever you prefer. Since serotonin and endorphins are released in these activities, exercising should help make you happier, lower your stress levels, and give you more energy. It is a good idea to absorb these feelings afterwards through a 15 minute meditation session where you can stretch your muscles so you don't cramp up and reflect so you can mentally clear your mind. Time to evaluate. If you want to eat something sweet, allow yourself one chocolate bar or bag of candy a week and eat a piece when you get a sweet craving. However, you should try to focus on eating healthy snacks and making those a part of your daily diet. Your meals should have an array of colorful vegetables, whole grains, and lean proteins. If you go out to eat, opt for a salad or another light, healthy option. It is also a good idea to share meals, since restaurant portions are often enough for two people. Exercise should not be a chore. If you don't feel like doing elliptical, turn on your favorite song and dance. Switch it up to keep it fun and stay engaged. It can always help to have a friend embark on this journey with you, but overall, it is a personal one. With each day that passes, although it may be difficult, you will be proud of yourself. Those moments when you reach for an apple instead of a cookie, or stand up and walk instead of staring blankly at a screen, are empowering and turn positive habits into a lifestyle. 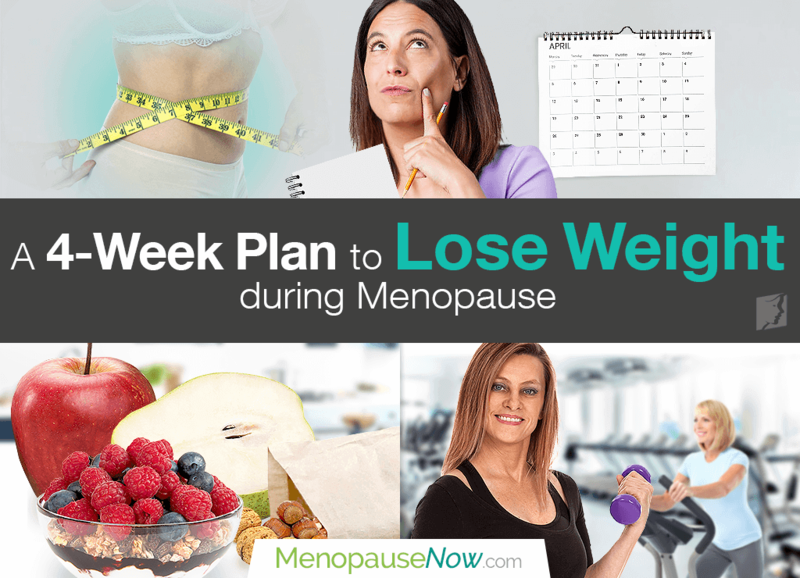 Click here for more information on how to lose weight and prevent weight gain during menopause.